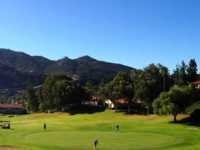 The Fountains is an 18-hole course rated as one of the top ten courses to play in San Diego County. Built on 600 acres of beautifully manicured grounds, the Fountains Golf Course measures over 4,000 yards from the tournament tee markers, posing a challenge to even the low handicap golfer. Yet the resort tee markers provide a relaxing and enjoyable experience for all skill levels. The friendly staff, the golf course conditions and the value create a truly outstanding, memorable golf experience.